The Flat Belt Holster hugs tight against your body offering a lowprofile carry option. It fits most pistols and smallmedium revolvers and features an ambidextrous design with an adjustable reversible thumb break. 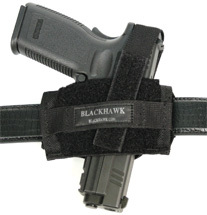 This belt slide style holster is constructed of 1000 denier Cordura nylon and fits belts up to 2 wide."